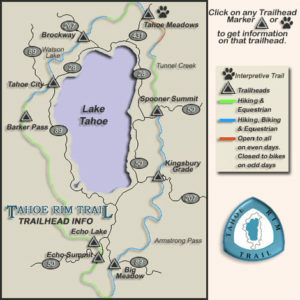 You have heard of the Tahoe Tim Trail. The Tahoe Rim Trail is a 165-mile long-distance hiking trail which forms a loop around Lake Tahoe in the Sierra Nevada and Carson ranges of California and Nevada in the United States. If you are looking for a shaded hike that is about 1.5 hours and has views the entire route, I have the perfect 3.6 mile section for you off of Brockway Summit. The destination “Picnic Rock” is without a doubt, the shortest hike you can take to obtain these spectacular long range views! Friendly for the whole family this hike is easy to find. On an unseasonably warm November weekend, I opted to pack up a picnic and head out with my 10 year old and dog to take in some views. The 1.5 mile climb up a single track is shaded, and offers a nice uphill climb with switchbacks through the Tahoe National Forest. 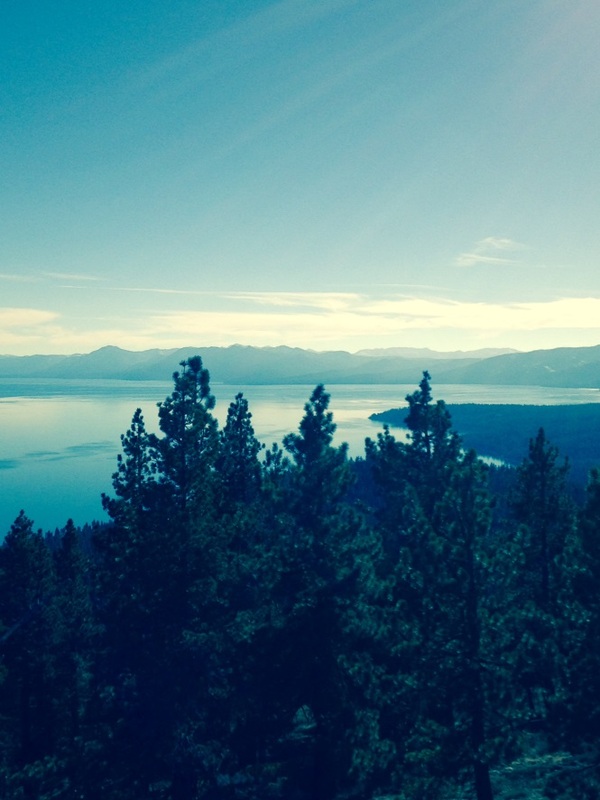 The views of Tahoe literally begin at the trailhead and continue up to the destination. The uphill is somewhat strenuous for those with health conditions, but there are very young children hiking it all of the time. Follow the switchbacks up approximately 1.2 miles until you see a sign labeled Spur Trail on the left. Follow it up an additional .3 miles to rock formations named “picnic rock”. 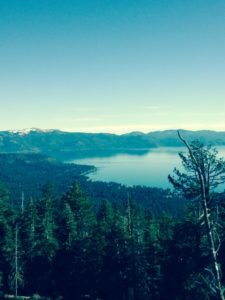 Once you are perched on your rock, you will be rewarded with views from a vantage point unlike any other in Lake Tahoe. Looking towards the lake, you look down on Kings Beach, North Tahoe Regional Park, and Agate Bay. Panoramic views sweep across Incline Village, East Shore, South Shore, Desolation Wilderness, the West Shore, finishing with the ski runs of Northstar. If you turn around and look behind you, you will see all of Donner Summit and Hwy 80, Truckee, Martis Valley, Mount Rose and Mount Baldy. I can’t think of any other vantage point in Tahoe that you can do this! It is amazing. Bring your camera. From Northstar, head up Hwy 267. (5-10 min) Just after you crest the summit, look for a parking lot on your right. You can park here, or take a left onto a dirt road up to the Tahoe Rim Trailhead. If you pass the “Lake Tahoe Basin” sign, you have gone too far. Enjoy the hike.